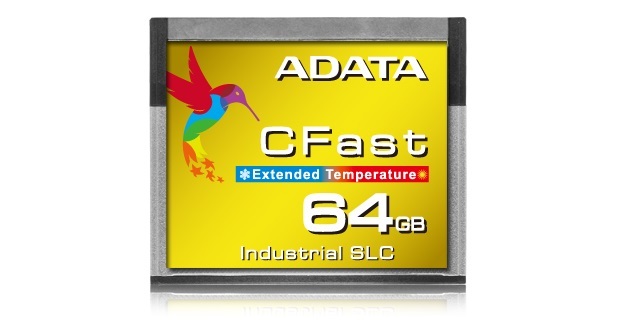 ADATA Technology, a leading manufacturer of high performance DRAM modules and NAND Flash products, today launched the ICFS332 industrial CFast card, which combines the form factor of a CF card with a high speed SATA interface to deliver reliability and secure operation for a wide range of industrial equipment applications. Utilizing fast SLC NAND Flash, the ICFS332 provides outstanding performance and reliability with sequential read/write speeds up to 560MB/400MB per second and an MTBF (mean time before failure) rating of 2 million hours. Thanks to an industrial-grade operational temperature range of -40°C to 90°C, the ICFS332 enables long term deployment in harsh environments that experience extreme cold and heat. The ICFS332 uses an industrial-grade SATA III interface and is available in 8GB to 64GB capacities. It has been designed for a plethora of scenarios. These include energy, automation, surveillance, transportation, networking, medical devices, and much more. The ICFS332 employs a full range of advanced technologies, including ECC (error code correction) and S.M.A.R.T. (self-monitoring and reporting technology) for high-reliability data transfer and improved security. It uses wear leveling technology to extend storage longevity, and with open API (application programming interface) support, the ICFS332 allows customer implementation of intuitive interfaces to easily manage data, monitor storage health, customize features, and integrate web services.